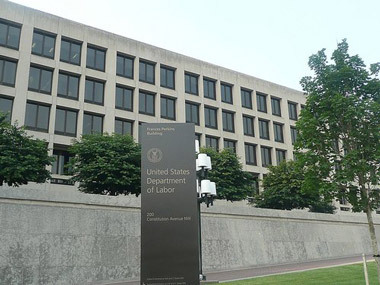 First round of DOL hearings prompts discussions on Best Interest Contract Exemption, mandatory arbitration as well as whether the proposed plan would spur lawsuits. Department of Labor headquarters in Washington where hearings are being held this week. A hearing Monday on the Department of Labor’s proposal to amend the definition of fiduciary advice on retirement accounts, drew testimony on ways to fix the plan’s Best Interest Contract Exemption, mandatory arbitration as well as whether the plan as proposed would prompt class-action lawsuits. While the topics might seem dry to someone outside the industry, their importance was vouched for in opening statements by Phyllis Borzi, assistant secretary of labor for DOL’s Employee Benefits Security Administration. She noted the hearing is “far from a dry exercise” in updating the 40-year-old Employee Retirement Income Security Act. Indeed, Marilyn Mohrman-Gillis, managing director of public policy and communication for the Certified Financial Planner Board of Standards, added that existing clients could agree to a BICE contract through “notification or negative consent,” while new clients, depending on the type, “could pick a time” as to when they’d sign a BICE agreement. Mercer Bullard, professor of law at the University of Mississippi Law School and founder of Fund Democracy, said that while the proposed rule’s litigation risk will be both public and private the “biggest” legal threat will come from private litigation. DOL will conduct the series of hearings at its headquarters in Washington from Monday to Thursday and hear from 25 panels; DOL employees will conduct a question-and-answer session with each panel. – See related ThinkAdvisor story, Democratic Senator Criticizes Fiduciary Rule as Hearings Near.